This custom, newly built chalet situated on 2.7 acres overlooks beautiful Brewster's Lake in Singhampton, Ontario. Just 15 minutes from Collingwood, our home offers the perfect accommodation for your holiday in Ontario! Designed with an open concept, cathedral ceiling living & kitchen space at 1300 square feet, it is fully equipped for your summer holiday on the lake or ski holiday to Blue Mountain! Furnished contemporary and antique furnishings. Canoe available to paddle around. 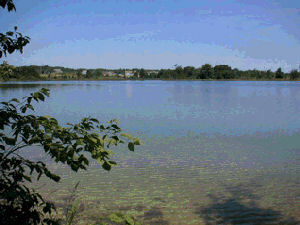 This is a private wildlife preserve - absolutely peaceful as there are no motorized boats allowed on this lake. 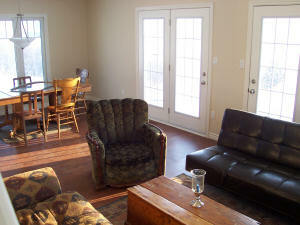 With 3 bedrooms, 2 bathrooms, the chalet sleeps 8 comfortably. 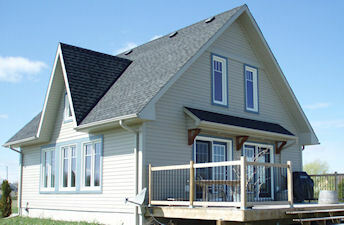 This is an ideal Ontario lake front accommodation!